The fishing on the Ranch has started to improve as the flows drop. The cfs out of Island Park Reservoir is 1300. I prefer the flows to be 1200 cfs and lower for the best dry fly fishing on the Ranch but we have to remember the farmers in Idaho also need water and Idaho is in a drought so we take what we can get. 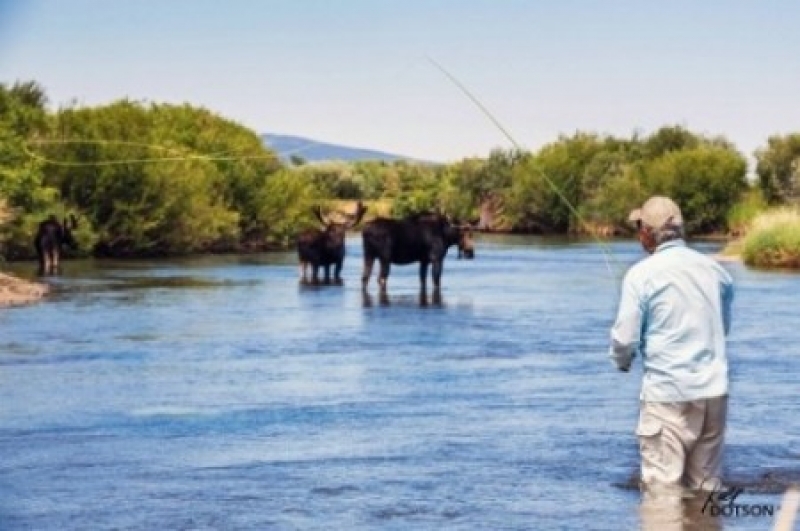 Things today are better than they were years ago before organizations like the Henry’s Fork Foundation started working with water users and keeping a close eye on this river that we all love. It is hopper time! Take a walk through Harriman and the number of hoppers you will see will amaze you. Grab one and throw it in the river and I guarantee it won’t make it very far before it disappears in a swirl. A #6 Morrish Hopper will do the trick. I also like #6 Rainy’s Hopper in the Ranch. Tan, pink and yellow all seem to work well. Some guys like using smaller sizes to but I don’t think it matters a whole lot. Also keep a sharp eye out for the Honey Ants. If you see them flying around put a #14 or #16 Henry’s Fork Honey Ant. Tricos also continue to do well. I would be on the Ranch by 8:00 AM. You may have to wait a half hour but there will be a good spinner fall. I would have #18 and #20 Trico spinners. The water is still high but the flow from the Island Park Dam is actually right at normal for this time of year. Dry fly fishing is not a very good option. Your best action will come from using a double nymph rig with and indicator. We recommend a couple of tungsten bead head patterns spaced about a foot apart. You’ll need to drop the upper nymph at least 3 feet below the indicator. A Black or Brown Rubberlegs is another good option. 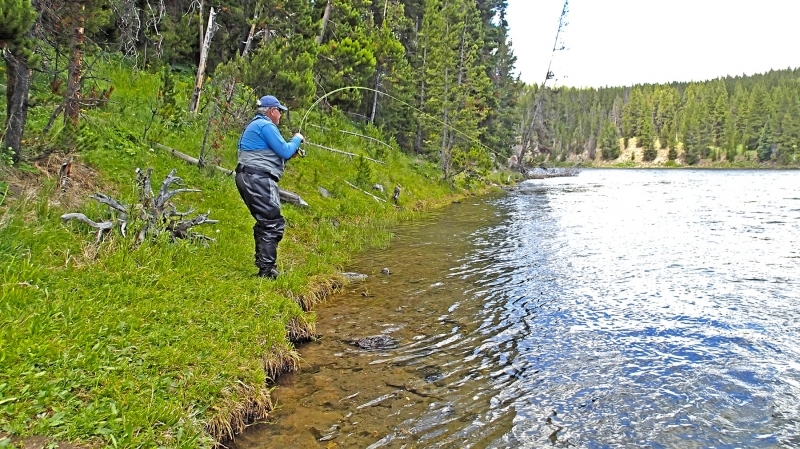 Streamer fishing can be very productive with the flows at this level. A daylight run through the Box chucking a streamer with a sink-tip line will likely produce some awesome strikes. I think a trip on the lower river is most definitely worth your time. Scott Kennedy, Tanner Lawson and myself did just that, this past Friday. We dropped a boat in at the Ora access and had a great day fishing big hoppers on the banks. Everyone in the boat landed a brown over 20”. We were also the only boat on the entire river that day. We floated Ora to Chester and it was an amazing day. Again Morrish Hoppers and Rainy’s Hoppers did the trick. I was fishing Tan #6 Morrish and Scott fished a #8 yellow Morrish. Tanner fished the #10 Rainy’s Hopper. I also noticed pmds and caddis on the water. When we got to the back waters there were fish up taking rusty spinners. #18 Hen Wing Spinners worked well. Warm River to Ashton continues to fish well with the hopper/dropper combination. A #10 Black or Brown Rubberlegs has worked well for the dropper. I would also have smaller bead heads like a #18 Silver Lighting Bugs and #18 Black Rick’s Tungsten. 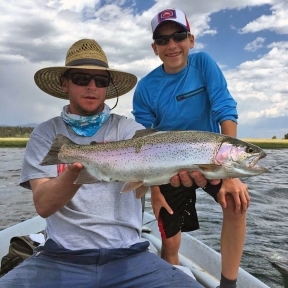 The lower Teton has come down quite a bit and the fishing has been a little tough. If you’re headed to the Teton I would focus on the upper end. As usual for this time of the year focus on mornings and evenings for the best dry fly activity. As the day begins to heat up then the hopper/dropper combination will work. I would have some #8 and #10 Pink Thunder Thighs or Near Nuff Hoppers. For a dropper #16 Tungsten Torpedoes and black or red #18 Rick’s Tungsten. The Madison continues to be a great option. Get on the Maddy early with a chubby and skate it around. There are still plenty of nocturnal stones around. Elden’s Golden Stone in #8 and #10 will work well. I would also have some Chubbys in the same size. Purple and royal are my favorites. As the sun climbs high the bite on the nocturnal stones will slow down but you can fish the same patterns again in the evenings. There are still great caddis throughout the day and some pmds as well. Casting hoppers will also work well for you on the Madison. The South Fork has really been producing some amazing fish this summer. Lots of large brown trout and cutthroat have been put in the net this summer. It’s time for the Nocturnal Stone flies on the South Fork. Start you day in the early A.M. on the South Fork for some non-stop action. #8 Chubby Chernobyl’s in red or purple skated off the bank and shallow riffles will keep your rod bent! The Pink Alberts can still be found in the riffles. I like a #16 Hi-Vis Rusty Spinner in the morning on the South Fork and when the emergence begins I like #16 Lime Stone Cripple and #16 Pink No hackles. As always smaller bead heads Like #16 and #18 Zebra Midges fished deep in the back eddies will work. The Park continues to fish well. Look for large cutthroat smashing Green Drakes in the Yellowstone River. A #10 or#12 Lawson’s Extended Body Green Drake will work well. I would also have some streamers in hand. Little Kim’s in gold or silver is a favorite of mine. A stop at the Madison in the park is a good idea as well. In the morning look for Trico spinner fall and the caddis in the mornings and evenings can be good. As always use caution when in the park and remember you’re not on the top of the food chain! 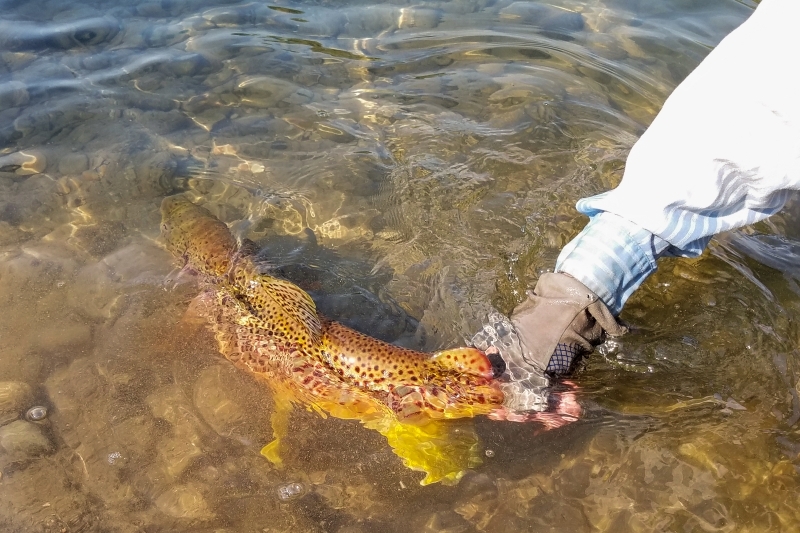 The lake report has not really changed much from last week, Hebgen continues to fish well in the mornings with the Callibaetis hatch. Henry’s will start improving as we head towards the end of the month. If you’re in the area a stop at Island Park Reservoir is worth your time. The west end of the reservoir has been fishing very well. Try seal leeches in different colors. I like blood leech and tan.